We broke a window in our old 1920's home in North Park. Pacifica Glass showed up on time and had the window fixed in under an hour. I was so impressed with the professionalism and attention to detail while they replaced our window. Everything was top notch and we couldn't be happier. Welcome to Pacifica Glass Company Inc. 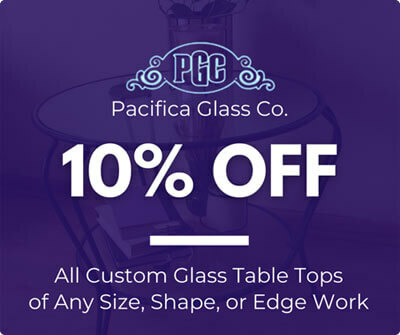 Welcome to Pacifica Glass Company, San Diego County's best value for residential and commercial glass sales, installation, repair, and replacement. We offer a full range of services for all kinds of glass products, including windows, doors, railings, shower enclosures, table tops, mirrors, ornamental glass, and more. 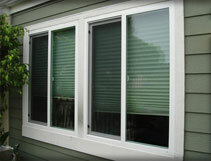 We also sell, install, repair, and replace window and door screens. There's a reason we're the company more San Diego County contractors trust with their windows, doors, and other glasswork: our employees average over 20 years of experience in the industry; we're an authorized dealer for the industry's leading glass manufacturers; and we produce exceptional work at cost-effective prices. We have an A+ rating with the Better Business Bureau, and we're fully licensed, bonded, and insured. 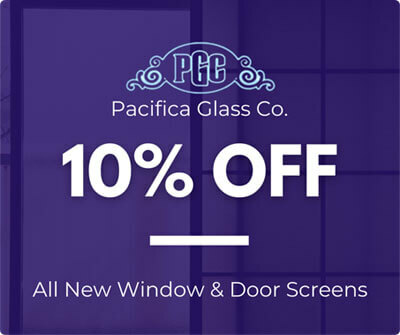 At Pacifica Glass, we believe in high quality, professional service at a great price. Our rates are very competitive, and our skilled craftsmen complete projects quickly without cutting corners. We can do most installations in one day and ensure flawless, long-lasting workmanship that does absolutely no damage to your stucco, drywall, or other surrounding materials. Our expertise is in sales, installation, repair, and custom design services for glass doors, windows, and a wide variety of other glass pieces, including framed and frameless bath and shower enclosures, table tops, shelves, mirrors, and more. 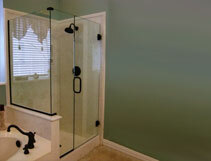 In fact, most of our glass products--from windows to ornamental glass--are custom made. We sell and install all types of glass for a wide range of applications, from windows and doors to decorative mirrors and shelving. Our extensive inventory features the industry's top manufacturers of glass for windows, doors, shower doors, fencing, table tops, shelving, and mirrors, including Herculite, Milgard, C.R. Laurence Co., Cardinal, Ply Gem and Wardrobe & Bath Specialties, all available at the best value in San Diego County. If you can imagine it, we probably have it; if we don't, we can customize it for you. 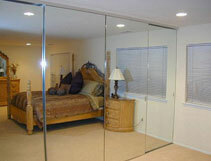 We even sell and install window and door screens, which can be customized just like our other products. We work on projects that are as small as one window to as large as entire homes and businesses with numerous, differently sized windows and doors. We offer free onsite estimates throughout San Diego County for all installations. After performing a thorough inspection and consultation, our knowledgeable estimators make a professional recommendation for the best door, window, or other glass piece for your needs and budget. As part of every window and door installation estimate, we evaluate whether the room is too hot or too cold so that we can recommend the right window or door for ideal temperature control. Not only will this improve your indoor comfort, but it will also help you save money on heating and air conditioning bills in the future. Whether you're looking for residential or commercial glass, functional products or ornamental pieces, Pacifica Glass can expertly, affordably, and efficiently meet your needs. We're large enough to serve all of San Diego County, and we've accrued thousands of satisfied customers over the years. Call today to schedule your free onsite estimate. 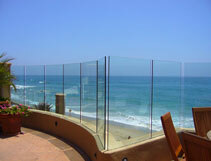 When you choose Pacifica Glass, you're choosing San Diego County's most trusted and experienced glass company.